Summer is nearly ending, but the Farmer’ Market is always packed with interesting ingredients especially in Northern Italy. So far in Oregon and Northern Italy we have discovered and tried slender Japanese shishito peppers, furry Lion’s Mane mushrooms, Pink Oyster mushrooms, vibrant zucchini flowers, sweet Italian frying peppers and bitter Treviso raddicchio. One of our favorite new ingredients has been kohlrabi, these pale green and deep violet bulbous stems with antennae-like leaves are high in Vitamin C and fiber. While they might look like a root, these spherical bulbs are swollen stems of the plant that actually grow above the soil line. The name ‘kohlrabi’ is of German extraction and is an amalgamation the words for cabbage and turnip in German. 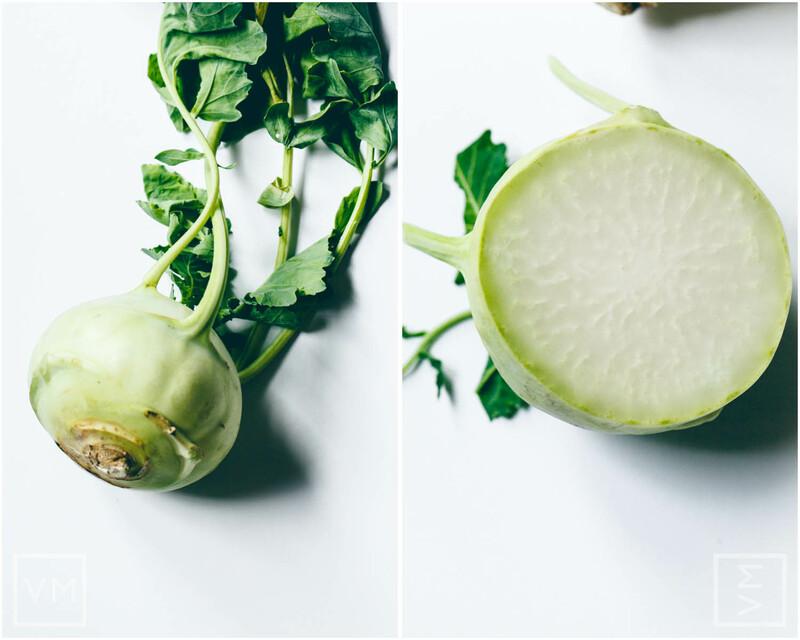 The mildly sweet kohlrabi has similarities in flavor and texture to a daikon radish or turnip, just slightly more sweet and crisp. The small ones are tender and sweeter as the large bulbs have a woody and radish-like flavor with a tough flesh. They are found in two colors: pale green and vibrant purple, The purple types vibrancy is only skin deep though since they actually have a faint yellow flesh. There are endless ways to eat kohlrabi making it one of the most versatile vegetables at the market. 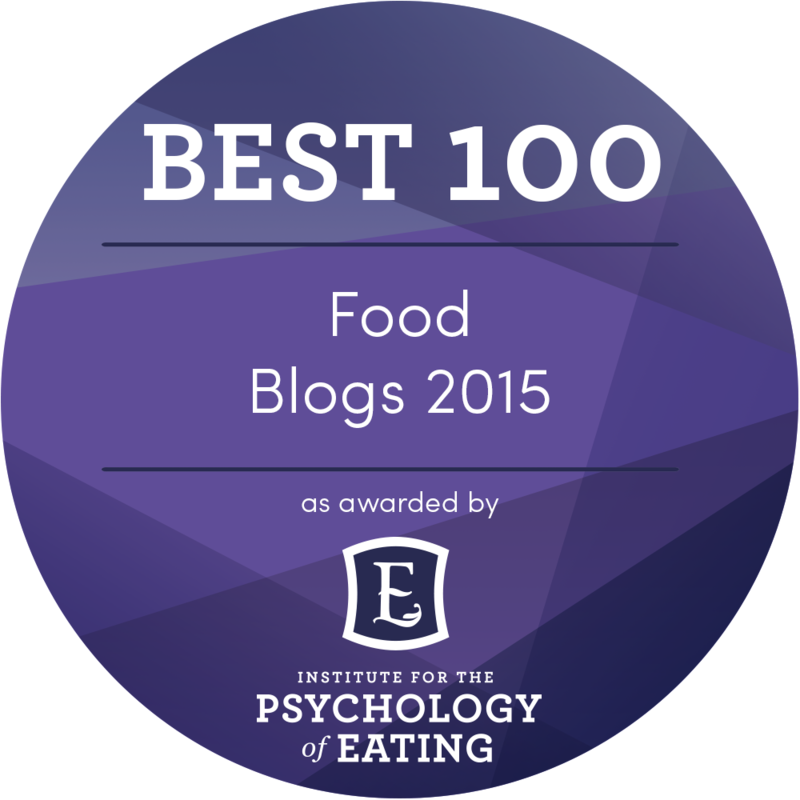 It can be prepared raw in salads and slaws, cooked in soups and curries, sautéed, roasted, steamed, fermented, pickled, shredded or even julienned to make ‘raw’ noodles. What a brilliant and convenient vegetable to have on hand! I was craving something creamy, simple and delicious – so I used kohlrabi to make my vegan Cream of Kohlrabi with kohlrabi greens, baby golden potatoes and Lion’s Mane mushrooms. You can substitute Oyster mushrooms for Lion’s Mane, or skip the mushrooms altogether if you prefer but they do help to provide more flavor and texture to this lovely and creamy soup. This lusciously creamy and comforting soup is an evolved version of English ‘Clam’ chowder and makes wonderful leftovers as well. Stir in some Italian black truffle salt and/or drizzle some fruity Italian olive oil to really make this dish rich and decadent. 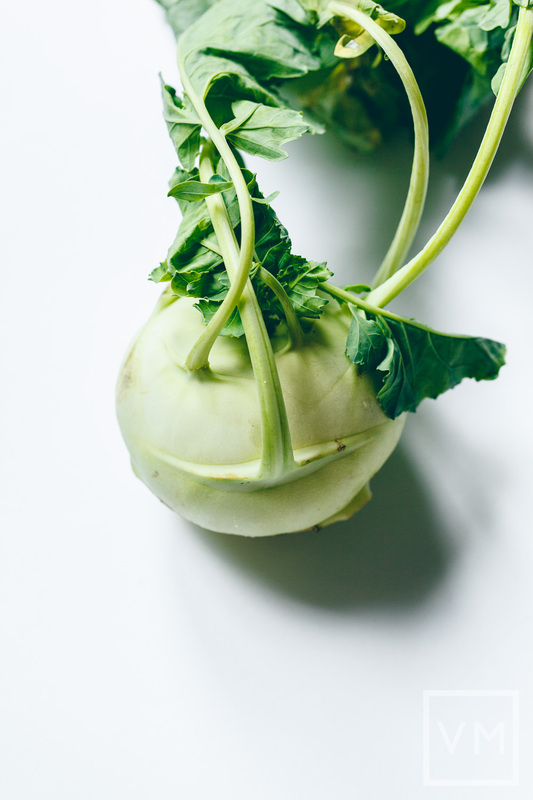 If you are unable to find kohlrabi in your area, turnip is a potential substitute. Kohlrabi is grown all-year long, be sure to select the ones that are small and tender. Avoid kohlrabi with marked brown spots or yellowing leaves. The larger ones, over 4 inches in diameter, tend to have tougher flesh and taste woodier. Choose firm and small bulbs, 4 inches in diameter or less, with attached healthy-looking greenish leaves. Scrub them clean. Snip off the attached stems and leaves and be sure to save them! The leaves can be used raw in a salad if young and tender or cooked by sautéing or steaming until tender as you would kale or collard greens. Kohlrabi has a tough fibrous layer. Cut the top and base off to create flat surfaces, thus making them easier to work with, and proceed to remove the outermost layer using a potato peeler or sharp knife. A white or pale yellowish flesh will appear when the tough outer layer is removed. 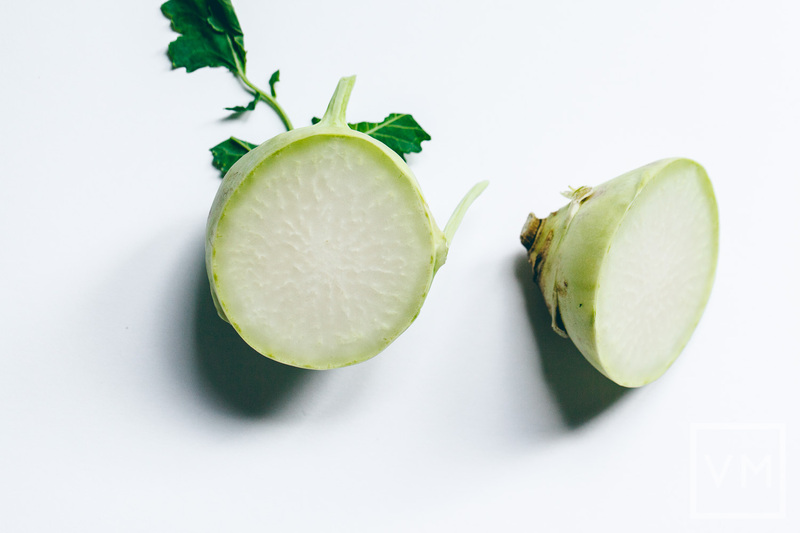 Now you can proceed to slice, chop, cube or cut the Kohlrabi as needed. The stems and leaves attached to the kohlrabi should be trimmed before storing and placed in a damp paper towel for 2-3 days in the refrigerator. Fresh kohlrabi without the stem and leaves will last up to a few weeks in the refrigerator (vegetable drawer). Kohlrabi does tend to get woodier though, the longer you store them so it is still best to try and use them as soon as possible. Now onto the furry Lion’s Mane mushrooms, a family friend picked these beauties up at a Farmers’ Market in Portland (Oregon). Several funny monikers for this type of medicinal mushroom include Bearded Tooth, Hedgedog, Satyr’s Beard, Pom Pom, Monkey Head and Mountain Priest. They are also a common ‘meat alternative’ in Chinese and Japanese vegetarian cuisine and can be purchased dried or fresh. This is an OPTIONAL ingredient for the Cream of Kohlrabi but provides an exceptionally ‘meaty’ texture. Along with Oyster and King Trumpet mushrooms, we find the Lion’s Mane mushrooms to be a perfect substitute for seafood. 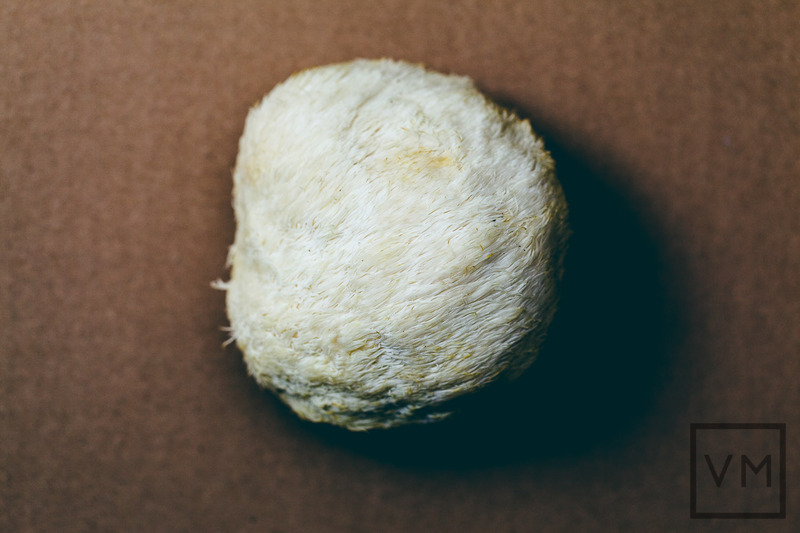 Lion’s Mane mushrooms can resemble lobster or crab meat as you pull them apart into bite-sized shreds. Preparing them is pretty simple. Gently brush the debris off with a delicate toothbrush or lightly damp paper towel and sauté them over medium heat until golden and crispy. Do not scrub them in water as they absorb a lot of moisture, however, if you have a prepared tasty sauce, they hold the sauce pretty well! Heat oil in a large pot over medium-high heat, sauté onions for 8-10 minutes until tender. Add the garlic and cook until it's just fragrant. Add kohlrabi and cook for 2 minutes. Add stock, water, cashews, bay leaves, thyme, white pepper and salt. Bring to a boil, reduce heat to low to simmer, and cook for 20-25 minutes until kohlrabi is tender. Remove bay leaves. Using an immersion blender, puree soup until smooth. If you're using a blender: let the soup cool first before blending and blend in small batches. Add steamed potatoes and sautéed mushrooms. Season to taste with salt, pepper and dried chili flakes. Serve in bowls with blanched kohlrabi greens and olive oil. Advance preparation: The soup will keep for 2 or 3 days in the refrigerator. Thin out if necessary with a little bit water or stock when you reheat. 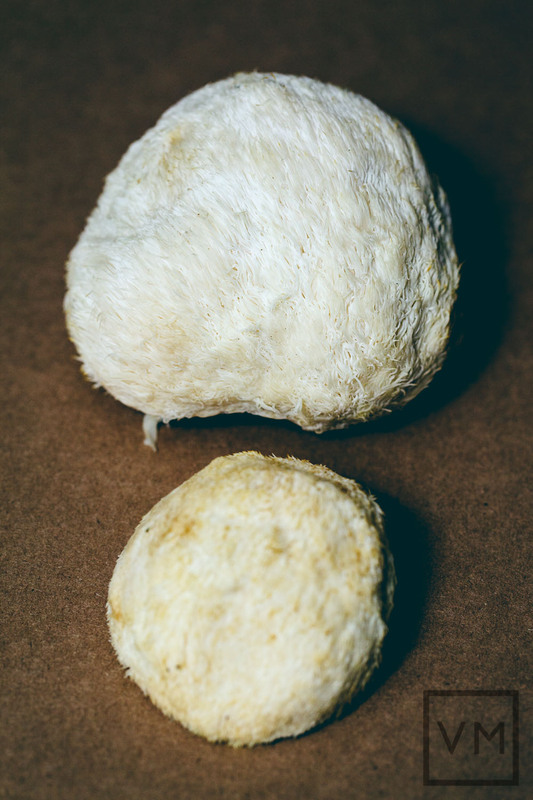 Have you tried kolhrabi or Lion’s Mane mushrooms? What new ingredients have you found so far at the Farmers’ Market?